Jae Y. Lim, M.D., a graduate of both Yale and Stanford, has been recognized as one of America’s Top Doctors from 2004 to 2006 as well as a Northern Virginia Top Neurosurgeon in 2015. As a Board Certified Neurological Surgeon Lim specializes in a minimally invasive procedure that allows for the reduction of surgical impact as well as increases a patient’s recovery speed. 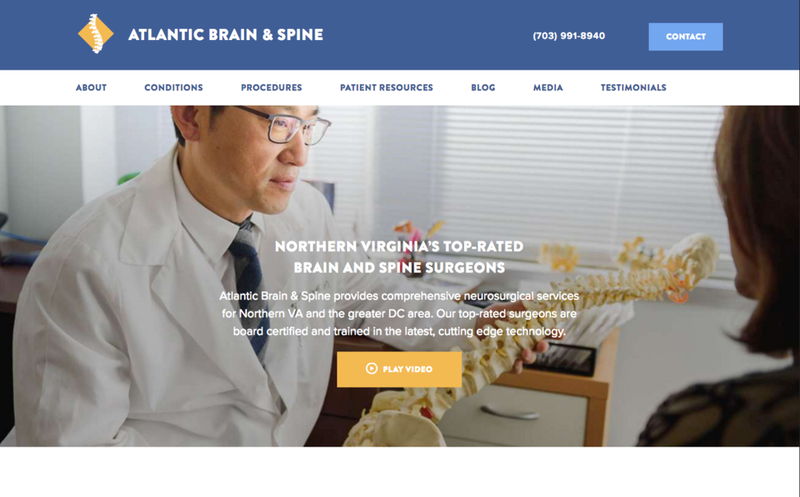 Currently, Lim serves as one of the main surgeons at Atlantic Brain and Spine and is an Assistant Clinical Professor of Neurosurgery at Virginia Commonwealth University School of Medicine. Lim has been practicing medicine for almost 21 years, and is affiliated with multiple hospitals. However, before becoming a client of Exclusive Public Relations Lim had absolutely no marketing assistance. As a Public Relations Professional, Samantha Frontera, faced the challenge of helping a well renowned surgeon who had no media presence gain a plethora of media coverage. Frontera was confronted with a few challenges as a publicist throughout the client’s campaign. Firstly, the number of patients who are in need of Lim’s services is limited compared to that of a non-specialist. Ultimately, this decreases the target audience. Additionally, few people are aware of the economic and health benefits that go along with non-invasive spinal surgery. Lastly, this specific procedure was only available in a few specific locations, which posed a geographical challenge. Samantha Frontera began reviewing Dr. Lim’s mission; and, her research revealed three key points. One, it was vital to create a brand strategy that would educate the public of Lim’s prestige in his specific medical field-neurological medicine. This would include Lim’s educational background as well as his previous medical experience. Overall, this brand strategy would help to develop the public’s awareness of his importance as a neurological surgeon. Secondly, it was important for our media relationships to know about and understand the health and economic benefits that a non-invasive spinal surgery entails, especially for those individuals who may be in need of spinal reconstruction. Thirdly and lastly, by educating the public, fostering the growth of their understanding, people would begin to understand the beneficial advantages of having either Dr. Lim as their neurological surgeon or having a non-invasive spinal surgery. Consequently, the patient would then go out and hire Dr. Lim as their surgeon or specifically request a non-invasive surgery due to our strategic campaign delivery. Constructing a story to highlight Lim’s journey within the medical field was a key component for a successful media campaign. Lim’s educational background needed to be addressed in order for him to be viewed as a trusted expert within the industry. Lim focused on and used his influence within to support the innovative idea of robotic spine surgery. This cutting-edge technique can only be found at a limited number of hospitals, around 40 to 50, in the United States. This campaign, illuminating the rarity of the procedure, led to several media placements in radio spots and journals within the first few months of Dr. Lim’s campaign. Dr. Lim’s target audience (elderly people with spinal issues) was another area of development. A client, such as Dr. Lim, would strongly benefit from a media placement in a health related journal or health related broadcast (radio/television). Those exposed to these media placements will feel encouraged to pursue this new surgery, because they believe it is the most advanced method of help. Dr. Lim has asserted his belief that robotic surgery, specifically spinal, is the way of the future. Medical students are currently being trained to operate with the robotic machinery, and as more hospitals gain access to these specific machines there will be a significant increase in the need for doctors who are able to perform robotic surgery. Lastly, it was vital to make the health benefits known to health journals and broadcasters. A large percentage of elderly citizens suffer from some degree of spinal pain, which makes spinal help an in demand field. In fact, about 80% of American citizens will deal with some type of neck or back pain during their lifetime. This robotic surgery will increase surgical accuracy and therefore lead to a significant decrease in complications. Patients will experience a decrease in postoperative pain, which ultimately will enable a faster recovery. Spinal robotic surgery’s main goal is to provide patients with a more effective solution to their neck and back pain, which will allow them to return to daily tasks sooner than non robotic surgery.